Foundation degree graphic design students at the University Centre Rotherham (UCR) have created a variety of marketing materials for a number of events at Wentworth Woodhouse, including Christmas markets, tours of the house and a lecture series. The new £10.5m university campus opened its doors to students and adult learners in Rotherham town centre in September. A re-brand project of the Wentworth Woodhouse café is also one of the projects the students had the chance to take on with a real-life client. Mark Williamson, commercial manager at Wentworth Woodhouse, said: "This is a fantastic opportunity for us as a team to work with students from UCR that may have a completely different outlook to what our materials need to look like. "We don't want Wentworth Woodhouse as an estate to have a feel of old, dusty and serious, so a fresh and contemporary look to our branding may be just what we need to attract our audience." Each project included a presentation to display the theory behind each design as well as an example of what each design could possibly look like as a final product. Design ideas ranged from a focus on one of the house's large chandeliers, an iconic piece of furniture, to more modernist themes. Brad, one of the students who has been involved in the project said: "I really enjoy making my design with a modernist approach, with a strong focus on the content rather than just the visual image. 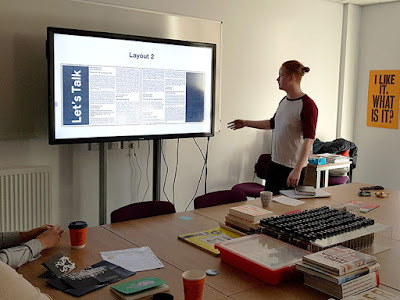 "My brief was to create a leaflet for the lecture series, but I felt the word "lecture" would perhaps put people off attending the programme; and so I swapped it for a more relaxed style and simply re-branded to "let's talk."" The designs chosen are being used by Wentworth Woodhouse to promote their upcoming events. The Grade I listed mansion hosts an antiques and fine art fair next week and a Christmas market in December.